Let’s face it, an aquarium isn’t exactly travel friendly. I mean, try slipping past a TSA agent with a fish tank in your possession – assuming you can carry it, that is! The last time I flew, I was grilled just for having an open water bottle in my bag. Imagine what they would have done if I was carrying my fully stocked reef tank! Leaving your fish at home. Spending your entire vacation worrying about how your fish are doing. Three simple tricks you can use to keep your fish fed and happy while you are away from home. It doesn’t matter if your fish are in a pond, saltwater or freshwater tank – all three of these options will work for you. So, enjoy your vacation knowing full well that your fish won’t starve. Should you feed your fish when you go on vacation? 1. Place your friend or neighbor on fish food duty! 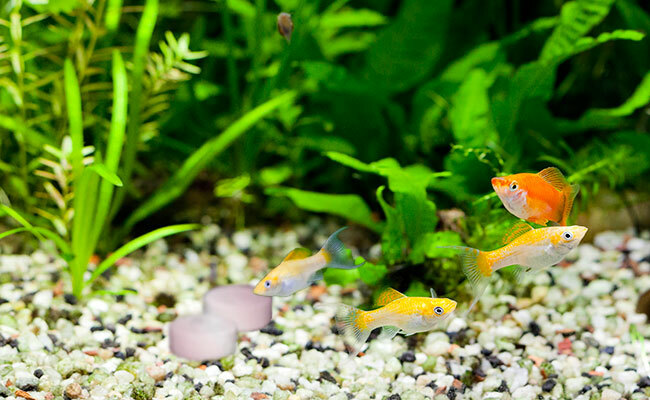 Believe it or not, many fish can survive for weeks on end without food. Let’s face it – fish in captivity have the good life! Would your fish have food hand delivered to them in the wild? A good meal might not come along for days or even weeks. Eating daily is a luxury. So, exactly how long can fish survive without food? Almost any fish can go two to three days without eating – many experienced fishkeepers will happily leave their fish for this length of time without feeding. That’s good news if you are planning a mini weekend vacation. But what if you want to vacation for longer? What is the maximum amount of time you can go without feeding your fish? As always, when it comes to fishkeeping, the answer isn’t black and white. The size and age of your fish often determine how long they can go without eating. To put it simply, larger/older fish have more fat reserves they can draw on when times are tough. Big cichlids can go a lot longer without food than pencilfish. Another factor is what your fish eats. Herbivores (plant eaters) will eat every day while carnivores (meat eaters) tend to go days between meals. These are not hard and fast rules and can vary according to the type of fish in your tank. What I mean by this is, how long will your vacation be? Three days? A week? Two weeks? However long, this is the goal of your trial period. Let’s say you are skipping town for a week. You will want to see how your fish hold up over seven days without food. But it’s not just the food you want to stop. You need to skip all maintenance as well. After all, you won’t be performing any chores like water changes while on vacation. During this time, monitor just how well your fish hold up. Check your fish for health and signs of stress daily and observe how everything holds up. If your fish can go the distance then congratulations, you don’t need to do anything more. You can go on vacation knowing full well that your fish will be just fine. However, if you had to end the trial early because your fish were worse for wear, then don’t worry. 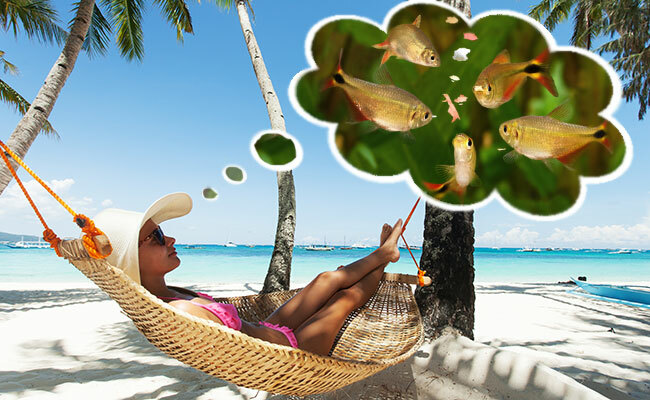 I have three solutions that you can use to keep your fish full while you enjoy your vacation! Forget a baby sitter, you need a fish sitter! While a betta or a few goldfish will be relatively easy for even an inexperienced sitter, your reef tank is another story. 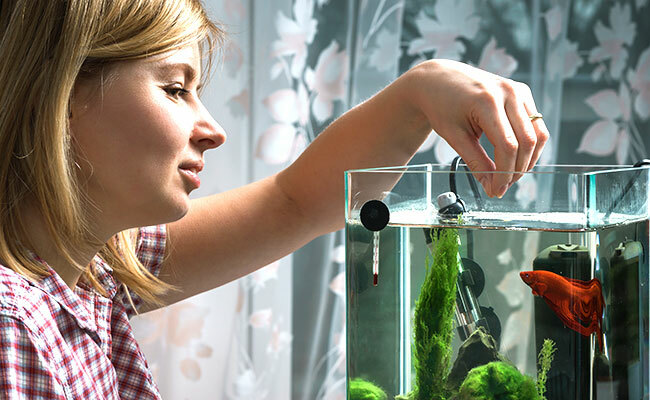 If you are lucky enough to be part of a hobbyist club or community, you might be able to convince someone to take care of your fish while you are away. But failing that, you will need to call in a favor from a friend, family member or neighbor. Remember how much you had to learn when you set up your tank? It is unfair to think that your neighbor or friend, who doesn’t have the same fishkeeping knowledge, could maintain your tank. So, the trick is to keep it simple. Now that sounds like a simple instruction, right? 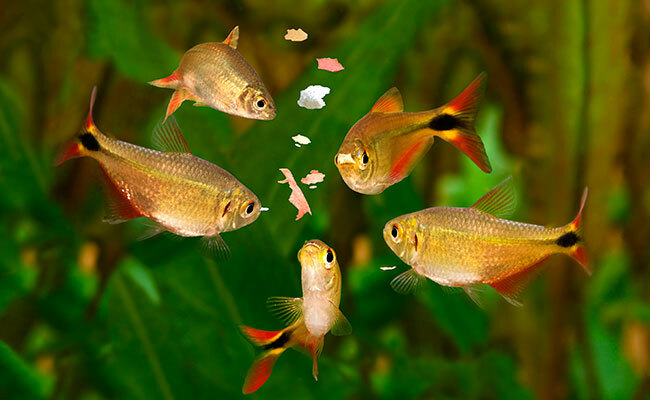 If there is one thing that people who are inexperienced with fish love to do, it’s overfeed. The best way to get around this is to pre-measure each feeding into a container. I find that the best way to do this is with a pill organizer. It holds a perfect daily serving of whatever your fish’s favorite food is – kelp flake pellets, algae tabs. You can even use it to store servings of frozen brine shrimp or blood worms. All your fish sitter has to do is empty each container of food into your tank at the appropriate time – it doesn’t get any easier than that! You don’t want to come home to a stressed system just because your fish were overfed! Can’t find a good fish sitter? Your next best option is to call in the help of a robot to keep your fish fed. I am talking about an automatic fish food feeder. How this handy device works is actually very simple. Load it up with your fish’s favorite food, set the timer and walk away. The auto fish feeder will then dispense portions of fish treats every time the timer activates. You can even set it up for multiple feedings each day. Some brands of fish food feeders hold enough food to cover six weeks of feedings – more than enough time to cover the length of your dream vacation! Want to know more? Check out our guide to the best automatic fish feeders to find the perfect one for you! Slow release fish food is also known as vacation food – yeah, it’s pretty obvious that this product is designed to feed your fish while you are away from home. These little blocks of fish food come in all different shapes, sizes…oh, and flavors! Whether you have bettas, bottom feeders or marine fish, there is a meal that your fishy friends will enjoy. At first glance, slow release fish food doesn’t look like anything special. Just a hard, oversized chunk of fish food. Have you ever seen a bath bomb fizz the moment it comes into contact with water? Well, these blocks of fish food work similarly. Except instead of dissolving before your very eyes, these blocks of fish food break down over days. As the block gets softer, it releases food into the tank, much to the joy of your hungry fish. Slow release fish food is perhaps one of the cheapest solutions to feeding your fish while on vacation – a pack will only set you back a few dollars. Simply toss a few blocks of food into your tank before you leave. Fish food blocks are categorized by how long they will keep your fish fed. Weekend feeder blocks last up to 3 days, just long enough to keep your fish fed while you escape for a weekend getaway. Vacation feeder blocks last up to 14 days, long enough for you to take a long road trip or relaxing vacation. Want more info? Check out our detailed slow release fish food guide. So, there you have it. Three great methods to stop your fish from starving while you are on vacation. But these products and services will at least ensure that you have live fish to come home to! How do you keep your fish fed when you are away from home? Let me know in the comments below! I used one of those vacation feeders. The triangle block ones. It fogged up my entire tank. Don’t use them. Unfortunately, this is a common experience by people who use vacation feeder blocks. Why not try an automatic fish feeder instead? 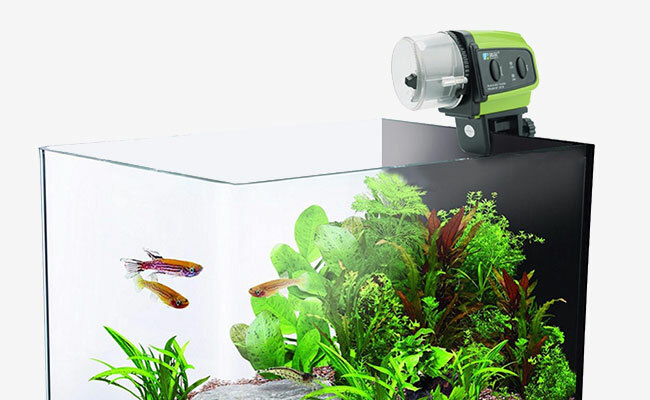 It will allow you to feed your fish it’s favorite food while you are away! I don’t feed my fish when I go away and they are just fine. I don’t see why anyone worries about them when they go on vacation. Fish are tough little things. You make a good point, some fish will happily last without eating every day. I agree with you and actually covered this in the first section of the article. However, for extended periods away from home, it is a good idea to have someone or something that can take care of your fish while you are away from home. Went with fish feeder option. Fish won’t go hungry when I leave home now. Good choice, a fish feeder is probably my favorite method of feeding fish while away from home. Every time I trust my family or friends, they always overfeed my fish.